There’s no shortage of books about writing and hopeful writers will devour not only ‘how to’ books, but books by and about ‘famous’ authors to hopefully glean that little nugget of information that will lead the hopeful onto a path of publishing and fame. In Why We Write, editor Meredith Maran has collected short bios and Q&A’s with twenty writers of varying styles. Anyone picking up this book is likely familiar with most of these authors, if not all of them. The book really offers nothing new except that the common mantra (“I write because I can’t imagine doing anything else”) comes straight from the individual. I don’t mean to say that I don’t have those glorious moments when I look at a paragraph and find it every bit as graceful and illuminating as I wanted it to be. I’ve been known to do a little jig around the room when that happens. The problem is, I can’t let myself proceed until I’m thoroughly happy with that paragraph. Every writer’s manual on the planet tells you to just spill it all out and polish it later. I haven’t been able to do that since the late seventies, when I was writing the serial on carbon paper, choosing my words and moving on immediately because of the daily newspaper deadline. The word processor, as much as I can’t imagine life without it, has only made me pokier, since it enables me to polish endlessly. At best, I’ll write only a page or two a day when working on a novel. I want my books to read like a brisk run through the woods, so my job is to get the obstacles out of the way. That takes time and sweat. A lot of people assume that a fast read is a fast write. Oh, if only that were true. There are twenty authors here and each gets 10-11 pages which includes a short bio, a vital stats (including awards), a bibliography of their works, a few paragraphs that read like responses to questions, and a “Wisdom for Writers” bullet-point list. It all comes across as pretty generic. Most of these writers are pretty busy with whatever projects they are working on and they likely shot off their responses without a great deal of in-depth thought … or at least that’s how it comes across. There’s nothing ‘bad’ or ‘wrong’ here. It’s a pretty average book that I wouldn’t steer you away from nor would I encourage you to read it. Looking for a good book? 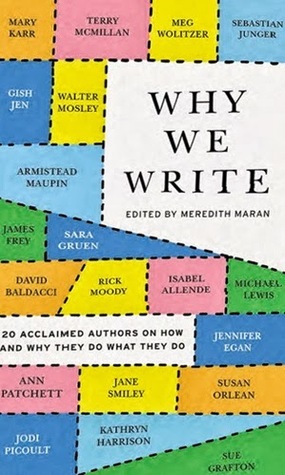 Why We Write, edited by Meredith Maran, is a collection of material, including some very brief essays from working writers on why they write. It’s pretty safe fare and not likely to provide much insight.